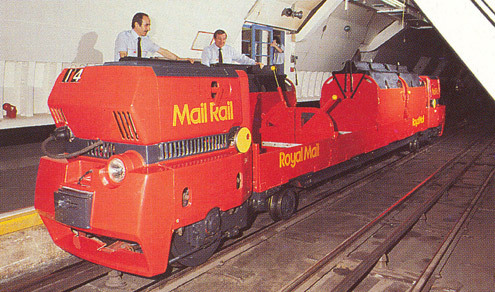 Anyone who watched this evening’s Great British Railway Journeys will have seen the Royal Mail’s underground postal railway featured. In the episode presenter Michael Portillo visited the Post Office (London) Railway, as it was originally called, and was given the rare opportunity to take a short ride on one of the trains. Today Mail Rail, as it is more affectionately known, remains closed and is not normally open to visitors, but due to the interest in the network, and to try and give as many people as possible a flavour of the railway, the BPMA guided Michael on his journey across this part of London. The postal underground railway, despite closing down in 2003 after many of the stations it served above ground were no longer operating, and after the Travelling Post Office stopped running from the mainline London stations, holds great fascination for many. 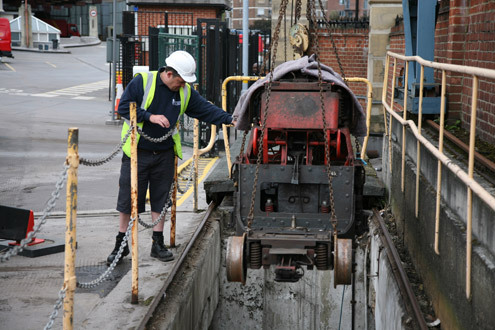 For this reason the BPMA are currently working to conserve three of the original railway cars in its collection, and are also planning on hosting a special Mail Rail themed open day at the BPMA Museum Store in Debden, near Loughton. The one day event, aimed at all the family, and specialists and non-specialists alike, will take place on Saturday 21st April 2012 from 10am till 4pm. Throughout the day BPMA staff will be on hand to help guide visitors round a series of events and presentations about the railway. There will be an opportunity to listen to talks about the history of the railway, and its predecessor, the pneumatic railway, with a chance to see the only two pneumatic rail cars known to exist from the 1860/1870s London trials. There will also be film showings including never before seen film of the railway with its driver-less electric trains running for the final time. Curators will also be available to guide visitors around the Museum Store and explore some of the objects related to the railway in the BPMA collection, including the three rail cars that are undergoing or about to undergo conservation. During the day there will also be activities aimed at younger visitors. Booking is not required but larger group wishing to visit are encouraged to contact the BPMA in advance to make their visit easier. There is lots more information about the Post Office (London) Railway on the BPMA website and further details about the event will also appear on our website nearer the event. The BPMA thanks The Arts Council England PRISM Fund, and the AIM Pilgrim Trust Conservation Scheme for their support of the Mail Rail Conservation project. This entry was posted in Collection, Events and tagged curator, Great British Railway Journeys, London, Mail Rail, Michael Portillo, museum tour, open day, pneumatic railway, Post Office London Railway, Post Office underground railway, railways, restoration, Travelling Post Office. Bookmark the permalink. Saveɗ as а favorite, I really lke your website!